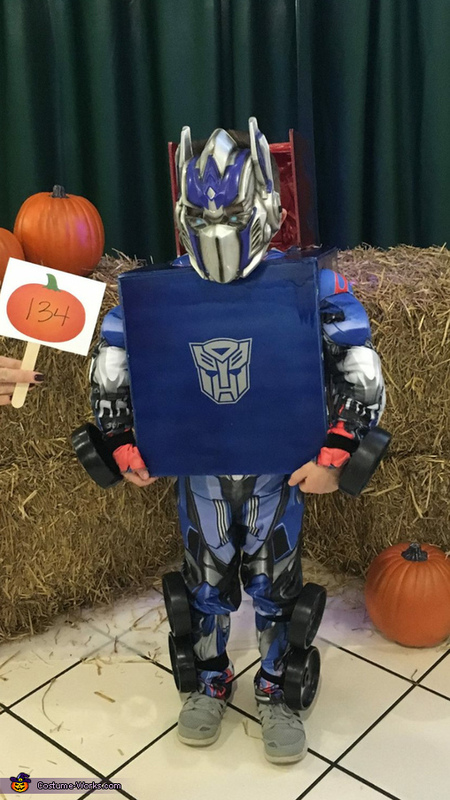 My son, Ashton, is wearing a transforming Optimus Prime costume made by his dad. The costume idea came from a YouTube video. The costume is made out of foam board that was spray painted and hot glued together. Battery operated LED lights make up the headlights and cab lights. Wheels were made out of lawn mower replacement wheels. PVC makes up the smoke stacks. Decals of transformers and flames were also added. Ashton starts as Optimus Prime and transforms to the ground as the tractor trailer then transforms back to Optimus Prime.